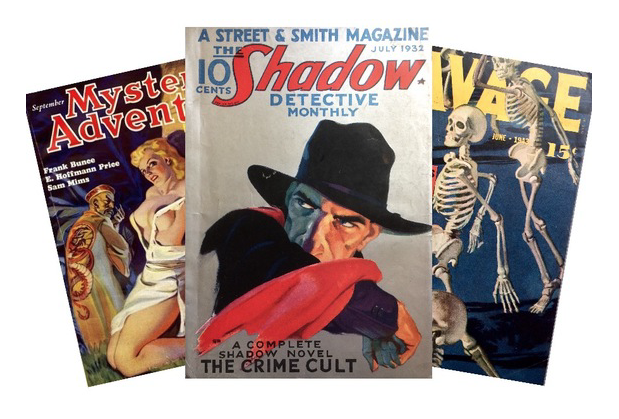 Do you have pulp magazines or pulp art you want to sell? You are at the right place. I have purchased tens of thousands of pulps over the last decade. I regularly purchase pulps from individuals, collectors, dealers and estates. I am interested in any amount of pulps in any condition from the 1950s and prior. If you are unsure of the value of your collection, then see the What Are My Pulps Worth page on this website. My goal is to buy your pulps in a way where both parties are happy and where you will not have to do a lot of work. I would love to purchase any original cover painting or interior illustrations that you may have. Even if you are unsure as to if your piece of art was ever used as a cover, that is fine. See the pulp artist list at the bottom of the page to see which artists I buy. There are over 1,400 artists on this list. If your art does not match a name on the list, don't worry, I would still love to know about what you have. When buying pulps I like to keep it simple. I only need to know what you have and the general condition. Here are the best ways to do that. Taking group photos is the fastest way to let me know what you have and show the general condition. This is much faster then doing a detailed list of every pulp and their condition. In many cases you can get away with just taking group photos and not even bother with an inventory. This is particularly easy if you have a smart phone. You can email or text these photos to the contact info on the lower right of this page. You can make a list of what you have, but this is optional. To make it easy on you, you do not need to indicate every issue's condition in detail. Simply indicate the amount of issues in each title, year span of each title, and the average condition. Most of the time, I will still want to see some pictures. Start off with a general description and if I need some more info I will let you know. Once again, this is optional. ​Books: Fiction from the 1900s - 1950s with some exceptions. Art: Original cover or interior art done for pulp magazines or book covers. Fanzines (Fan Magazines) - Any pulp related fanzine. Any pulp ephemera such as advertisement signs or club membership pins to Doc Savage, The Shadow etc. If you have come into the possesion of a pulp collection from an estate, it is likely that some of the above is present as part of the estate. Books, Art and Fanzines do have value so please include these as part of the pulp collection. Sometimes these can be worth more than the pulps. The pulps made it possible for thousands to become paid authors. It provided a medium for an author to get his start. This is also the case with artists. There where many artists who started in pulps who went on to do book covers, slick magazine covers, comic books or even fine art. On the other hand, there where many artists who did some pulp covers and then nothing else in the field of art. Towards the bottom of this page is a list of almost 400 artists who have been published in the pulps. If your piece of art is by one of the artists then there is a chance that it was used as a cover. I am also interested in the interior illustrations done for the pulps or other art from the first half of the 20th century. In short, I would love to know what you have even if you are not sure whether or not it is pulp art. You and I both want to know what your collection is worth. There are tens of thousands of different pulps out there and some are worth a lot of money, on the other hand, many are not worth much. You can read up on some tips to evaluate your pulps value on my What Are My Pulps Worth page. Another way to find out the value of your pulps is to browse my store. You may find several of the pulps that you have in my store. This way you can see what I would sell them for. I generally pay 35% to 65% of the value of your pulps. I would say the average is 50%. If the majority of your pulps are issues that I already have multiple copies of, then I can't pay as much for them. However, if your collection consists of issues that I don't have, I can do much better. One thing to keep in mind is that when you sell on eBay, they are going to take about 10% of what they would sell for and the money paid in shipping. Then PayPal takes 3%. That is a smaller percentage then what I pay but, my goal is to make it easy and fast for you. For example, shipping 1,000 pulps to one person is a lot easier than shipping 1 pulp to 1,000 people. Not to mention taking 1 - 4 pictures of each pulp, grading and describing each etc. There is a great reference book called "Bookery's Guide to Pulps & Related Magazines" by Tim Cottrell. You can purchase this book on eBay for about $30. This book has just about everything you would need to know to determine the value of your pulps. However, it was last published in 2005, so it is a bit out dated. Most of the pricing holds true but, not all of it. One of the best ways to know what your pulps are worth is to see what they have recently sold for. At the end of the day, the value of anything is determined by what someone will pay for it. You can get this data by doing a search on eBay and refining the search to "Sold Listings". This will show you what those items have actually sold for and not just what people want their copy to sell for. Last but not least, ask me. I won't bite. I love hearing from curious people. If you have pulps to sell, I will probably buy them or point you in the right direction on how to sell them. Another alternative is to trade in your pulps. You may find some issues on this site that you want. I would be happy to work out a trade. Just let me know what you have and want and we can make a deal. I am looking for any of the below titles. I have highlighted certain titles that are more desirable to me then the others. However, there are certain issues within these titles that are more desirable or less desirable. Below is an extensive list of artist that have done work for pulp magazines and other fiction magazines. I would be interested in any art by these artists.